Having the issue of not being able to place item frames or paintings in the overworld ever since i placed them in the end. Still takes effect after leaving the game and coming back. This is thie most serious issue that I have encountered. The max rate of spawnables could benifit from being raised. Also, I have not been able to create any sort of trap for squids or hostiles that I spawn. Im not sure if this is an issue or not, but I feel like I should be able to horde them like other animals With this I feel that all spawn eggs should still be able to be used even in peaceful. Creative should be creative, and this limits freedom of creativity which completely ruins that concept. All in all, I think that spawn eggs are really a waste. It seems to be hit and miss.... One pulsar has yet to fail though.. But all clocks lock up eventually.. I can partially confirm this. Clocks set to a three-tick cycle will short out when they havent before. Clocks set to a four tick cycle or higher seem to work normally. I have had no issue with rapid pulsars when using a six-torch set-up. Using less torches has always had a propensity to fail. As for the lighting error, update to TU10. As best I can tell, this bug has been fixed with that update. If animals are only spawning in a taiga biome in your world, check for cliff faces, small caves, and sink holes in the other biome areas to make sure that the animals that should be spawning in those areas are not just trapped in areas where they cannot move more than 20 blocks. If an animals cannot move more than 20 blocks in any direction, it will not despawn when you leave the area and consume a space in the animal cap limit (i.e. preventing an animal from spawning out in open somewhere else). Chunk errors can occur from time to time; but they don't appear to be very frequent (I've found 2 in about 50 or 60 worlds I've started since I bought the game). I do recommend deleting that world and starting a different file. However, I did manage in the one world once to clear the chunk error by digging out everything underneath it and replacing the area with different blocks. That world is still playing fine. In the other world, I was never able to clear the error and that file finally just froze up completely. The lighting error is back for me as well. I finally got around to the update and started to check my main world for issues and most of my tunnels were black even though i had them completely lit up. Fortune III enchantments are way more common than silk touch. You can get a fortune III pick w/ unbreaking III & efficiency IV on your first few tries w/ level 30. It takes several minutes to get silk touch, let alone w/ unbreaking III & efficiency IV. That can literally take me about 45 minutes sometimes. It can also take a good 15 minutes to get a particular painting. I think there's something wrong w/ how the game picks random things. Some things have way better chances of happening than other things. Also, speaking of this, can we get a painting selection screen when placing a painting as well a sign edit option? TNT seems to do way more damage w/ my blast resistant armor. Was it nerfed severly, or is this a glitch? A small fraction of the TNT necessary to kill me can kill me easily now. You live several seconds after a lethal explosion & then you die. Mobs still phase through walls. This is a major issue in my XP farm. Please fix it. Mobs keep escaping from it by phasing right through the walls. 4 torches should work, but they almost always burn out. Clocks set to a 3-tick cycle do burn out (torch = 1 tick delay + 2 tick delay set to a repeater should burn out). Interesting... I've played a LOT this weekend so far, mining extensively on Level 12 (near lava) and haven't noticed a single issue with the lighting at all. Prior to TU10 in this particular world, the lighting issue was occurring literally every few blocks. I'll keep an eye out for it and let you know if it hits me again as well. i have noticed the old lighting glitch, but it is very rare now. but i have noticrd a new lighting glitch. some times areas will stay brightly lit after the light source is removed. Minecarts like mobs and walls can glitch through each other, making it hard to get minecrats w/ furnaces to push other minecarts. Edit: Oh, and when I was terraforming a hillside (It was screwed up a long time ago, so I fixed it up, making it look natural & adding a river) there were severe frame rate drops down to a few FPS. After I finished the river, I started growing trees, vines, & grass, and when I started planting & thinning out the grass, the game dropped to a few FPS for about 3 minutes as I did that. It lingered a bit too and lagged a little. OMG I cannot use different wood to make planks, only the original oak wood works, snow biome wood doesn't make planks FIX THIS NOW!!!!! So yea i started a new world and i was wandering around and well ... I think i will let the screenshots talk. This is the first time I've seen this happen and i am very amused. The water that is actually touching the dirt blocks is not the first time but the floating one is. OK so I was being my epic builder self when I noticed the only wool you can dye is white wool. You can't even dye other wool Into white wool to make the wool you want. Also not sure wether this is a bug. It is annoying though. Die the sheep it is cheaper then sheer them or breed them you can die any color sheep to another color you want..
Below is a picture with two bugs I found in one circuit. 1. 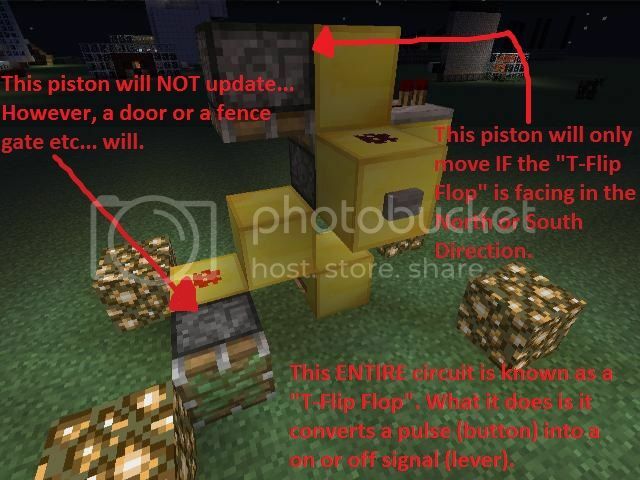 The piston coming out from the output of an instant T-Flip Flop does not receive a block update (Meaning it will stay on and not turn off when it is supposed to [meaning when the button is pushed] or vice-versa) ;however, I can place a repeater coming out from the output which causes the piston to update when it is supposed to meaning it will turn on or off (this defeats the purpose of this being an instant T-Flip Flop). 2. This instant T-Flip Flop will not work properly if facing in the East or West directions because the downward facing piston to the left of the upward facing piston will not turn on then off; however, if this instant T-Flip Flop is facing in the north or south directions the piston to the left of the upward facing piston will turn on then off. Note: These are all sticky pistons. They broke this when they patch the wool coloring machines you cant have this without having the other. the wool machines would change there color based on the north, south, east and west setting of the machines. I never complained about the color machine I guess to many people did so now you have neither, this seems to be related to my complex arrow machine as well that uses pistons, inverters and dispensers. Then it got worse with the removal of the sand generators. My arrow machine did not use a clock so it was not affected by the mentioned that I posted earlier in a post. However it did stop with your bug you have posted I am glad some one else has posted a similar bug. I do believe their filter is to strict and this is why neither of our machines work any more. It has been ever thus; and apparently on the PC as well. As EvilDogBoy pointed out, you can, however, dye any color sheep to any other color and then collect the colored wool right off the sheep. I hardly ever use the crafting table to dye wool anymore. RE: Animals Not Breeding Issue - Possible New Info. I still have further testing to do; but it now seems possible/likely that once the animal cap was reached and animals ceased to be able to breed and even though animals are slaughter and the animal cap is freed up, the breeding ability remains disabled. I realize I'm quoting myself here and I hope that is OK. This was so long ago that I thought I'd connect these two posts this way rather than by an ETA on the first post. I have been closely watching the animal spawning rates over the last while. I am able to breed animals again in the world where I had reached the cap and a couple of wild animals are again occasionally spawning in the areas around my animal pens. This is pretty much now what I was expecting to see in that area since the animal cap size and spawn rates were probably decreased with TU10. However, if I go completely across the map, I am still not get ANY animals spawning in the area of my second base (where I have absolutely no animals in captivity at all). If have thoroughly checked all cliffs, caves and sinkholes and found absolutely no animals at all in that area; whereas, before TU10, I used to find plenty. If the cap encompasses the entire world, this would make sense; but if the cap is somewhat regional to chunks, I would certainly expect to see some animals spawning in areas that are very, very far away from where I have my animal pens. sounds like an issue with your console rather than a MC issue. i play split screen with my wife with no problems. only thing i have a problem with in split screen is the pause you get when one player opens inventory, a chest, or crafting table. I also play with my wife on split screen and when we craft or open chest it lags a bit for a second. Also the screen size of chest and crafting is really small in comparison to the TV.